Congratulations on your decision to be married! You have found us because you must be planning your destination wedding celebration in Arizona at the Grand Canyon National Park. Arizona is the most beautiful place in America and a wonderful place for a destination wedding. 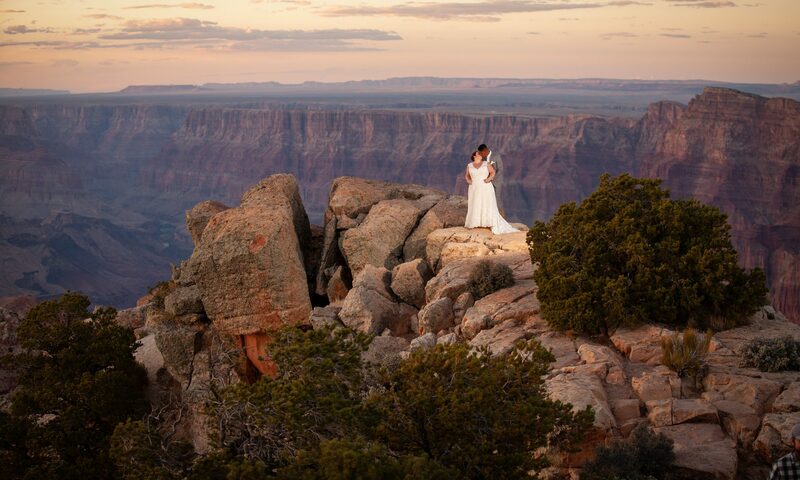 Our Grand Canyon Weddings are among the most inspiring on this planet. We specialize in weddings at The Grand Canyon National Park in Northern Arizona. There is no place else on earth quite like it! Your Grand Canyon wedding ceremony can be as simple as meeting the wedding officiant to exchange your vows, or we can create imaginative, custom wedding packages for you. The Grand Canyon is enormous and has more than two million visitors in season. With our years of experience, we offer you appropriate recommendations for various wedding ceremony venues within the Grand Canyon National Park. We know the popular places frequented by tourists, but we also know some remote, private locations right on the rim of The Grand Canyon! We can introduce you to those who provide Arizona’s favorite wedding services. We know the very best wedding officiants who can customize the words and expressions of your wedding ceremony. We have experienced professional wedding photographers that can truly capture your Grand Canyon Wedding with images that will last generations. Our beautiful fresh flowers will be perfect for your wedding. We also have talented Arizona musicians like Native American or classic flautists, guitarists and harpists that will play for a Grand Canyon Destination Wedding. There are local places in town to have your reception, and we know the excellent caterers that can deliver everything for a delicious celebration inside the Grand Canyon National Park, including the wedding cake! Grand Canyon Wedding Packages enables you to celebrate your marriage in the best way possible. In fact, the possibilities are endless. Get an Arizona Marriage License, send your wedding invitations and grab your wedding rings! It all starts with your email or phone call to Northern Arizona Destination Management. Please mention “Grand Canyon Wedding Packages” when you contact us. NOTE: All packages are currently undergoing revisions for our 2019 offerings. If you request a quote, the details and pricing you receive may be slightly different than what is listed below. The packages detailed on this website represent some of the most commonly requested Grand Canyon wedding arrangements. However, they are definitely not the only available options. If you do not see what you are looking for in the existing packages, please contact us right away. We would be glad to discuss all of the options with you and create a customized Grand Canyon wedding package tailored to your specific requirements. We can easily accomodate groups up to 70 within the Grand Canyon National Park; and up to 250 in nearby Tusayan. Group size is limited to 70 for outdoor weddings within the Grand Canyon. There is an indoor location that can be used to accomodate larger wedding ceremonies that are beyond the capacity of the outdoor sites. If no specific date has been chosen, what is the general time frame you are planning for? Congratulations Sarah and Nick for eloping at the Grand Canyon! They decided to have their wedding ceremony at Moran Point.